After pickup from your downtown Memphis hotel, Our professional humorous guides will help you discover downtown Memphis and the Mississippi river all in one package. You will see some of the most famous and infamous sites around our historical city. Sites such as Beale Street, which is a location where all the blues clubs are located and has become a major attraction here in Memphis. We will also show you Victorian Village which are homes built in the 1800's, two statues of the Kin Elvis Presley and B.B King. You will witness history at the Lorraine Hotel where Martin Luther King was assassinated on the balcony, Elvis Presley's beautiful Graceland and even a stop at A Schwab, a 120 year old general store. Don't forget about The Peabody Hotel to stop and see the March of the World Famous Ducks! 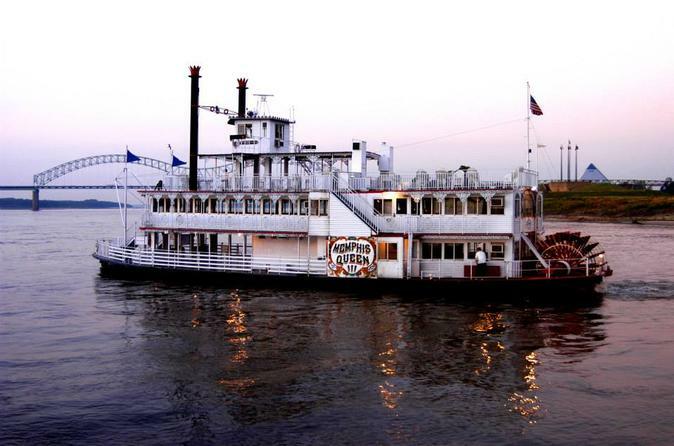 Then there is The Island Queen, a historical paddle-wheel boat with three decks offering great views. We will cruise down the mighty Mississippi River and soak in the sights as you hear interesting commentary from your captain. Pass by Tom Lee Park, named after Tom Lee, a worker who jumped into the river to save the lives of 32 passengers of a sinking steamboat in 1925. Along the way, you'll learn all about the history of the river and discover how Mississippi influenced commerce in Memphis and the surrounding areas. After this combo tour, you’ll be taken back to your hotel. This tour is seasonal and operates from March - November. Please Note: This is a ticket and transportation package only. Admission tickets without transportation are not permitted.